There’s no denying that Shea Stadium is a drab, uninspiring piece of sports architecture, a run-down 43-year-old stadium that leaves little room for improvement. The bright orange seats in the field level and the layers of paint cannot hide the fact that the home of the Mets was build in 1964 as a multipurpose facility that has become obsolete in these high-tech and lucrative times. The team has done what it can (except in the area of in-game music, where the CD catalog seems to reach only up to about 1987), but it can do no more. In a little more than a season — and a mere 97 regular-season games (and hopefully the full allotment of postseason tilts) — Shea Stadium will host its final game, and a gleaming new state-of-the-art ballpark (in the truest sense of the word) will open just to the east of Shea’s site. Everything about the ballpark will be new, including the surrounding chop shops and garages, which will eventually be bought (or seized), torn down, and replaced with housing, offices, retail space, restaurants and a hotel. Though not in time for Opening Day 2009, Citi Field’s surroundings will soon join the ballpark as a gleaming Queens treasure. 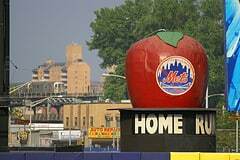 And so, as a devout Mets fan and a student, historian and lover of the great game of baseball, I think it would be wrong to move iconic Home Run Apple from Shea Stadium to the Citi Field outfield. The Citi Field drawings show an apple of some sort in the outfield, but the team has so far balked at declaring whether it would be the same old — the operative word here — homemade version or a new one. One online group wants to preserve the original apple in the new ballpark. I’m all for preserving it, just not within the walls of Citi Field. Instead, the Mets should install beyond the outfield wall whatever shiny new apple they feel fits the character of the new ballpark. The original Home Run Apple should stay exactly where it is. It can be removed while Shea is demolished around it, but once the old stadium is gone, put the apple back in its place. It’s exact place, or six feet from it. A look at the final image of Citi Field on the Mets homepage — the image entitled “Site Plan” — shows Citi Field’s placement in relation to Shea. A close look at the diagonal orange line that represents the current scoreboard shows that its left edge reaches to the sidewalk outside Citi Field. The apple currently rests near that edge of the scoreboard, if a little bit in front of it. Put the apple there, on the sidewalk. Preserving it in this way should allow everyone to have their apple and eat it too. The Mets can have their new mechanism in their new ballpark. The fans who love the old thing can see it every time they come to Citi Field — whether there’s a home run or not. They can walk right up to it, touch it, stand by it and have their pictures taken. They can look out across what will be a parking lot and imagine Shea Stadium’s home plate some 380 feet away. I’m a big fan of historical sites, of visiting a landmark or a site where important, watershed moments took place. In locations where neglect or decay have forced demolition of the old structures, I stand in the spot and imagine what was. To see the apple in its original location would provide a lasting memory of Shea, of the mountain of seats that rose to the sky and provided a hurdle for the planes taking off from La Guardia. It would leave a piece of the past behind, a reminder of the stadium that used to stand there.